Join us Saturday May 4th from 9 am to 12 pm for an invasive removal day along the Townsend Riverwalk! 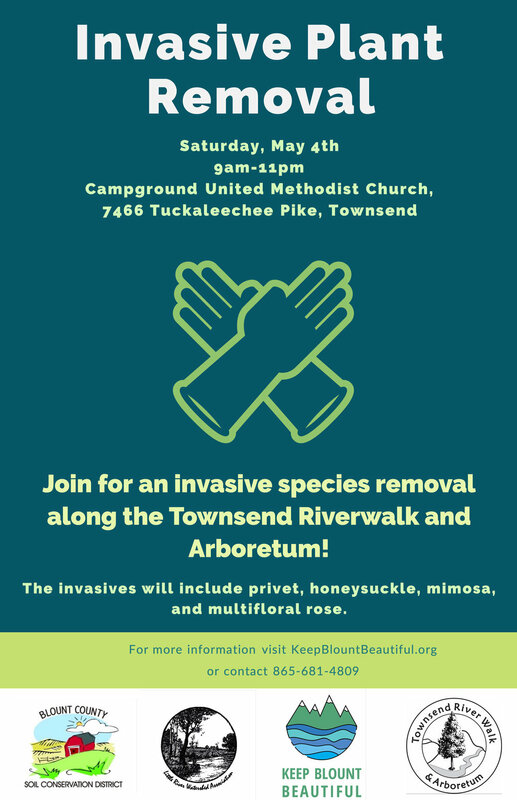 We are partnering with Keep Blount Beautiful, Blount County Soil Conservation District, and Tuckaleechee Garden Club to help remove invasive plant species along the Townsend Riverwalk and Arboretum. We will be removing privet, mimosa trees, honeysuckle as well as other easily identifiable invasive species. Removing invasives species and allowing for natives to return is critical to helping protect and better preserve the Little River Watershed. Parking is available for volunteers at Campground Church (corner of 321 and Tuckaleechee Pike). Be sure to wear sturdy shoes/boots and bring work gloves. Standard gloves will be available if needed. Water and snacks will be provided by the Tuckaleechee Garden Club. You can sign up for the event here! We hope you come out and join us!